What kills almost as many birds as outdoor cats – yet is going almost completely unaddressed? It’s not hunters, since hunting season is relatively short. It’s not wind turbines, either, though they’ve gotten a bad rap as bird killers. According to a study published in 2014 by the American Ornithological Society, up to a billion birds may be dying in the United States each year as a result of crashing into buildings, most frequently into windows. * And it’s not just the glass on towering skyscrapers that’s the problem, either. According to the AOS, about 44% of all bird deaths related to glass collisions happen at residences. How Do Windows Kill Birds? Think about it for just a moment from the bird’s perspective: a window reflects the trees and sky, and often looks like an inviting place to fly to. If you’re flying over long distances, which you’d do if you were migrating say from Florida to Maine in the Spring, a nice branch could be pretty inviting – until you collided with the glass reflecting it. Birds that migrate at night are in danger, too, because they’re attracted to bright, steady white and red light. If you have big windows that are lit from inside, they’re like a beacon to unsuspecting night flyers. Consider how tiny a migrating bird is. Now imagine it flying at full speed into a solid piece of glass. Even if the bird hits the glass and flies away, many times it later dies from internal injuries. Now imagine that happening as many as a billion times a day! What Birds Are Most Threatened? Though all birds matter, these small migratory birds are the ones that fill the world with song. In addition to the loss of their own unique imprint, when these birds die, all the music they make dies, too. Fortunately, there is a lot you can do to help protect birds from the windows in your home. 1) Paint or soap: You can use either a bar of soap or tempura paint to create a grid pattern on your window to break up the reflection. The grid should be spaced no more than four inches by two inches to be effective. 2) Stickers: Similar to the first idea, place stickers or decals on your window. You have to put plenty of them on to be effective, following the same spacing so the birds don’t think there’s a spot wide enough to fly through. 3) ABC Bird Tape: This product, available from the American Bird Conservancy website** and other online retailers, makes it easy to apply properly-spaced dots or grid patterns on your windows to deter birds. The tape comes in convenient rolls to make application a snap. 4) Window film: This product covers the entire glass surface and is best applied on the outside of the window. It dramatically decreases reflections from the outside while still allowing a clear view of the outdoors from inside. This gives you the added benefit of privacy while still allowing daylight to enter your home. Some window films will also help reduce solar gain into your house in the summer, helping to keep it cool. 5) Netting: You can install a taut section of netting outside of your window at least three inches away from the glass. This will cushion the bird’s impact and prevent them from hitting the glass. 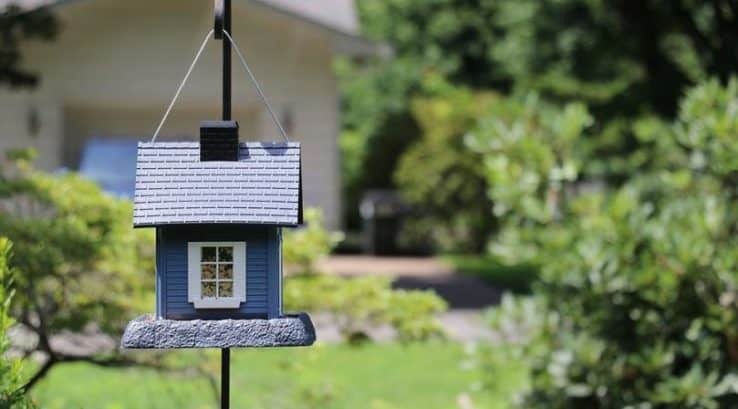 6) Screens: Regular window screens can cut down on reflections and keep the birds away. To be effective, the screen needs to be installed on the outside of the window and should cover the entire glass surface. 7) Branches: Tree branches can break up the reflective surface when viewed from a distance by the bird. While you can’t move a large tree conveniently, you can plan your landscaping accordingly so that the tree’s growth will eventually create that visual barrier. 8) Motion: Anything that moves in the breeze can make birds avoid the area. Suspend pie pans or CDs from the eaves over the window, making sure they won’t blow into the window themselves and scratch it. If you don’t have eaves, string up streamers of brightly colored fabric. 9) Lighting: Birds that migrate at night can be attracted to or disoriented by the lights of almost any structure. In fact, birds disoriented by lights can circle structures for hours on end, leading to exhaustion and forcing them to use up the energy they need to complete their migration. Birds are particularly attracted to steady-burning red and white lights. Turn outside lights off, replace outside lights with sensor-driven lights, and draw curtains and shades to contain indoor light. You might be thinking, “Many of these solutions aren’t the most visually-appealing to add to my home.” And you’re right. One option is to make them seasonal. Birds are most susceptible to window collisions in the spring and fall during migration. Make your windows bird-safe during the migration months to make the biggest difference.